The Tag Heuer Carrera Midsize Men’s and Women’s Watch WV2212.BA0798 is a study in sophisticated materials and classic style. This is the kind of timepiece that necessitates fine wine, polished silverware and priceless collections of Ming vases. It is difficult to define what, exactly, gives the Tag Heuer Carrera such an elevated status. 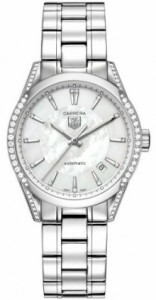 Perhaps it is the collaboration of 85 diamonds and a silky white mother of pearl dial that makes it so divine. Meticulous attention to detail and subtle placement of the gems assures that the effect is refined, delicate and, undoubtedly, aristocratic. You might expect to see this watch on the wrist of a Lady or a young Duke, but it would be equally beautiful in a professional setting. The Carrera, however, is more than just a stunning timepiece. The WV2212.BA0798 is durable, easy to read and comes with a shiny three-year warranty. With a beautiful polished steel case, a scratch resistant sapphire crystal and a deployment buckle, you can rest assured that this is a watch that will last for generations. Your son or daughter will love it just as much as you do. And since it boasts a self-winding automatic movement, the Carrera can be counted on to keep accurate time. After all, no one wants to be late for his coronation. Since the graceful hands are luminescent (as are the markers) this timepiece is guaranteed to be easy to read in the opera or in the office. Simply, the Carrera Midsize Men’s and Women’s Watch is pure, dependable luxury. Of course, if you’re looking for pure luxury but wish to spend a little less, there are other Tag Heuer options available, including the Carrera Calibre 5 WV211N.BA0787 which, with its stainless steel bracelet, luminous silver tone hands and rich brown dial, is a steal at only $2600. An even better deal is the elegant Silver Carrera WV211A.BA0787, which is perfect for everyday wear, boasts a effortlessly stylish design and can be purchased for only $2400. But for customers with refined taste and the ability to invest in a true heirloom piece, the Carrera WV2212.BA0798 is worth the money. This is a top-quality timepiece not to be missed.